Blurred vision is a lack of sharpness as a result the person is enable to see fine details or small objects. Blurred vision can occur when a person who wears corrective lens is without them. Blurred vision can also be a sign of various eye diseases like cataracts, glaucoma, age related macular degeneration, diabetes, retinal detachment, brain tumor, or optic nerve damage. 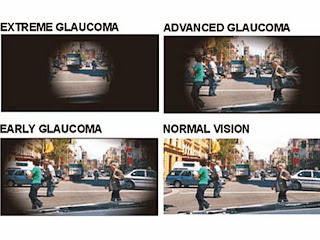 Glaucoma is a group of eye diseases characterized by damage to the optic nerve. (optic nerve carries images from retina, which is the specialized light sensing tissue, to the brain so we can see) usually due to high intraocular pressure. If untreated, it can lead to optic nerve damage resulting in progressive, permanent vision loss. It is a leading cause of preventable blindness among people, especially in America and Africa. The risk of glaucoma increases dramatically with age. But it can strike any age group, even newborn infants and fetuses. Glaucoma can be classified in two categories: Chronic Open angle Glaucoma and Narrow angle closure glaucoma. Chronic Open angle Glaucoma: It is the most common form of Glaucoma. The "open "drainage angle of the eye can become blocked leading to gradual increase in eye pressure. This increase results in optic nerve damage. Narrow angle Closure Glaucoma: It is caused when contact between the iris and trabecular meshwork, which in turn obstructs outflow of aqueous humor from the eye, as a result the drainage angle of the eye narrows and becomes completely blocked. When the drainage angle of the eye suddenly becomes completely blocked pressure builds up naturally and this is called acute angle closure glaucoma. The symptoms include severe eye pain, blurred vision, headache, nausea and vomiting. The treatment of glaucoma depends upon the nature and severity of each case. In general glaucoma cannot be cured, but it can be controlled. Eye drops, pills, laser procedures and surgical operations are used to prevent or slow down further damage.